Leap of Faith is an outdoor climbing adventure experience and is fantastic fun for all the family. 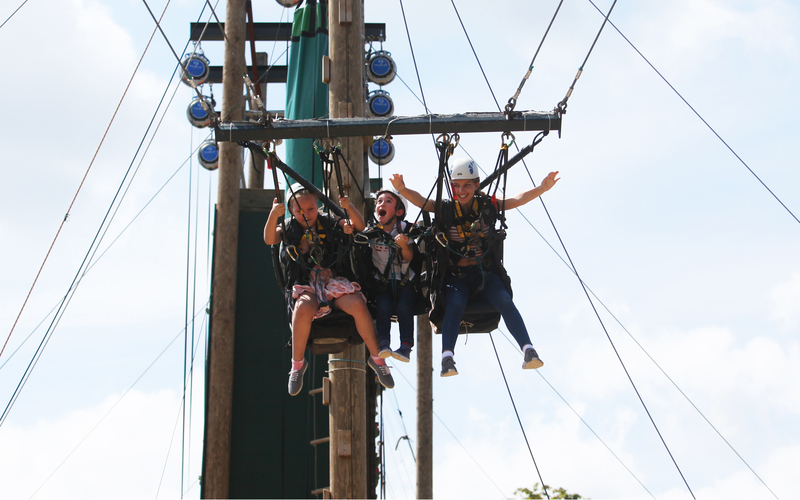 The whole experience takes about an hour and includes eleven amazing different climbing challenges, our namesake 'Leap of Faith' jump and Bristol’s only 25-ft Giant Swing! You can experience the whole course mix and match your chosen activities to create a unique day out! The course is available to both the public and visitors of the Wild Place Project on weekends and bank holidays, and can also be booked daily for birthday parties, groups, stags and hens, and corporate events. The course is suitable for adults and children aged four and over. Please see our FAQs for medical and weight restrictions. Our namesake leap is the ultimate test of your nerves! Get clipped in, climb the 25-ft pole, take a deep breath and make 'The Leap' for the bag. The most daring climbers can choose to have the bag up to 12-ft away, but if you’re not feeling quite so brave a jump of 2-ft may ease your nerves! A favourite with both adults and children. The Giant Swing offers an exciting adrenaline rush. Up to three people are strapped into paragliding harnesses then winched up to 25-ft in the air. Pull the pin and let gravity do the rest! Plunging through the air at high speed, it’s easy to see why this is an extremely popular experience. A great range of climbing challenges such as the rope race, our bear climbing wall, a high wire ladder, a 25-ft high ‘hang tough’ challenge and a totem pole. These varied adventure activities last about 40 minutes in total. Any other questions? Make sure you check out our Frequently Asked Questions page!